SCVHistory.com FF5103 | Tataviam Culture | Ted C. & Ruby Garcia, Hansen Dam Park, Pacoima ~1951. 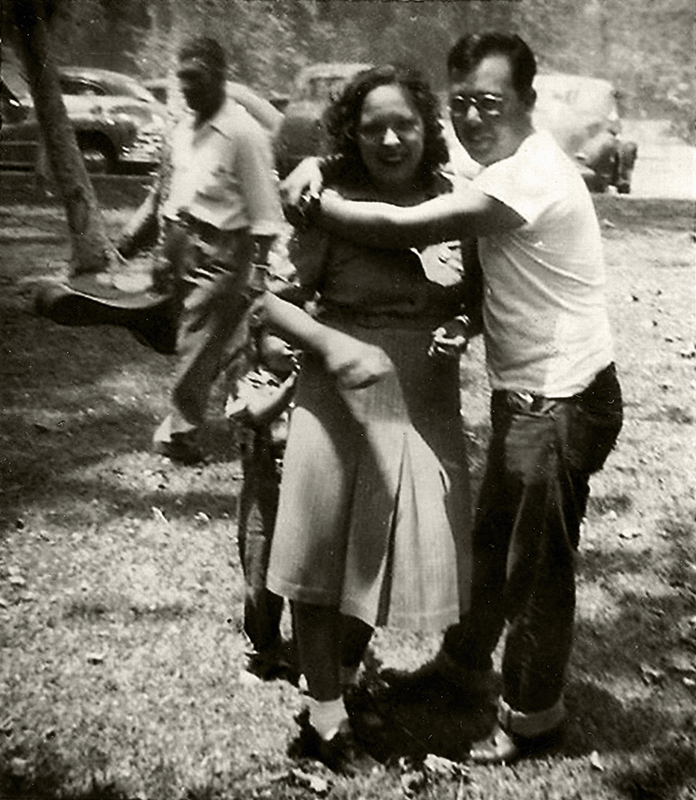 Theodore Cornelius (Ted) Garcia (July 10, 1920 - Sept. 20, 2008) and his wife, Ruby, at Hansen Dam Park in Pacoima, circa 1951. In the background with the guitar case is Ted's brother, Louis Garcia Jr. Hiding behind Aunt Ruby is Ted's niece, Heraldine Romero (daughter of Ted's sister Mary Louise Garcia Romero and Harold E. Romero). Through Chief Mary Cooke Garcia (1901-1975) — Ted and Louis Jr.'s mother and Hearaldine's grandmother — Ted, Louis Jr. and Hearaldine's ancestry can be traced to individuals who lived in the Santa Clarita Valley prior to European contact in 1769. FF5103: 9600 dpi jpeg from smaller jpeg courtesy of Geraldine Romero Perez.